This is EXACTLY why we need to get out and VOTE November 6th fellow Seekers. People like this leftist ASSHAT that could care less about the welfare of our troops abroad. It is really insane that anyone that considers themselves a citizen of these United States could hold such an opinion. Perhaps she would like to leave and learn 1st hand what it’s like being fired upon by the ENEMY. Arizonans need to get out on 11/6/2018 and give Kyrsten Sinema her walking papers. The Left hates America, and considers “right-wing extremists,” a term all too often applied to American patriots, far more of a threat than jihad terrorists. It used to be that this fact was dismissed as hysterical hyperbole. Now it is becoming increasingly clear. An old interview has surfaced with Arizona senate candidate Kyrsten Sinema, in which she co-hosted a show with a conspiracy theorists who blames 9/11 on the US. Government. Sinema separately said she didn’t object to individuals going abroad and fighting for groups hostile to the U.S.
U.S. Democratic Senate hopeful Kyrsten Sinema said “I don’t care” if people go and fight for the Taliban in Afghanistan in a newly resurfaced radio interview and co-hosted a radio show with a conspiracy theorist who claimed the September 11, 2001 terror attacks were perpetrated by the government, Fox News can reveal. 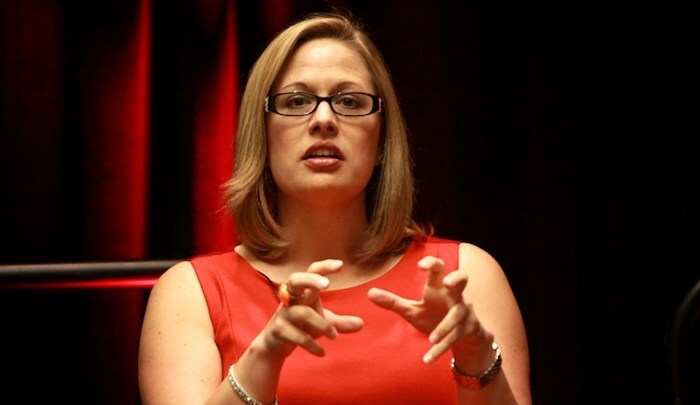 Sinema appeared on a radio show in February 2003 hosted by Ernest Hancock, a libertarian activist who presented “The Valley of the Sun” program on a local Arizona radio station. “As an individual, if I want to go fight in the Taliban army, I go over there, and I’m fighting for the Taliban, I’m saying that’s a personal decision,” Hancock told Sinema, who was then a Green Party activist. “Fine. I don’t care if you go and do that, go ahead,” she replied, according to the audio recording obtained by Fox News. In the same interview, Sinema said the U.S. military went into the Middle East for “a number of reasons,” including “oil, power, control” of the region. “There’s also, what I think is rather convenient, which is the switch and bait theory, which is, don’t pay attention to the falling economy, don’t pay attention to the tax cuts for wealthy, let’s pay attention to this horrible imminent threat,” she added. Just two months after the interview and a month after the start of the Iraq War, she told the Arizona Republic that “we should feel compassion” for enemy combatants killed in the country….